Growing, picking, preparation and cooking advice for these tasty berries, and recipes for raspberry-surplus salsa. With today's choice of varieties, you can enjoy fresh raspberries from early summer to fall whether you grow them yourself or buy them by the basketful. Raspberries can easily be grown throughout the country and come in a diversity of delicate hues including red, purple, black and yellow. 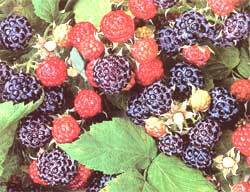 The richest flavored are varieties of black and purple raspberries. Black raspberries (sometimes called blackcaps) are firmer than red raspberries and somewhat bolder in taste. Purple raspberries are a hybrid of the red and black types, yielding large and richly flavored berries. Yellow raspberries develop a light pink blush when fully ripe, and are sweeter and more tender than the red types. All colors are highly aromatic and deliciously sweet with floral undertones. Raspberries are high in fiber and vitamin C, and are a rich source of the anticancer compound ellagic acid. Black raspberries are especially fruitful in antioxidant and cancer preventive agents. Fresh raspberries are highly perishable and are best used within one to two days for peak quality, flavor and nutrient content. Rinse berries with cold water just before using. If your raspberry patch only provides enough berries for fresh eating, you can buy larger quantities for preserving at local produce stands or farmer's markets. Prices will vary, but you can usually find flats (12 pints) priced around $14 per flat. The best way to preserve berries for winter use is by freezing, drying into fruit leather, or turning into jams or preserves. Freezing is simple: Freeze whole berries on a tray or cookie sheet, then pack loosely in freezer bags. To freeze raspberries packed in sugar, gently mix 1/2 cup sugar to each quart of raspberries and fill freezer containers to within 1 inch of the top. To freeze raspberries packed in syrup, fill freezer containers with berries (leave a headspace) and cover with a syrup made of equal parts honey and water, or 3 cups sugar and 4 cups water. Use frozen berries in pies, tarts, cobblers and muffins. Sprinkle over hot cereal, stir into yogurt or make a quick raspberry spread by mixing 2 tablespoons crushed berries with 1/3 cup soft margarine and 1/2 teaspoon cinnamon. Cook them into puddings and sauces, or make jam during winter after garden chores have died down. For a quick and delicious jam, add 1 cup frozen raspberries and Y cup sugar in a saucepan, bring to a boil and cook for five minutes. Pour berry mixture into a blender and process for 15 seconds or until thick. For more fruit flavor and fewer calories, why not make a low-sugar or no-sugar jam? Pomona's Universal Pectin, available in supermarkets or natural food stores, makes it simple with easy-to-follow, instructions and recipes. Easy to make, this recipe is a wonderful way to preserve fresh raspberries as a ready-made fruit salsa you freeze now and serve later. It's great for dipping, as a condiment for barbecue, or as a topping for baked or grilled chicken, turkey, fish and pork. This salsa also does double-duty as a sauce to serve over sweet potatoes, squash or rice. 4 cups fresh raspberries 1/2 cup chopped sweet or red onion 1 garlic clove, minced 1 to 2 serrano peppers, seeded and minced 1 to 2 jalapeno peppers, seeded and minced 1 red or orange bell pepper, cored and diced 1/3 cup fresh lime juice 1/3 c up chopped fresh basil 1 teaspoon sugar (optional) 1/2 teaspoon salt (optional) 1/2 teaspoon ginger (optional). In a medium-sized bowl, mix raspberries together with remaining ingredients. Leave raspberries whole for a chunkier salsa, or mash raspberries lightly with a fork before adding other ingredients. Let stand for one hour to blend flavors. Depending on use, freeze remaining salsa in 1/2 to 1 cup portions. Makes about 5 cups. Nourish Means . . .
What does "nourish" mean to you? Jamie Oliver, Michael Pollan, Alice Waters, and other voices explore this question in this video from Nourish. What does NOURISH mean to you??? Best-selling author Michael Pollan explains how food marketers have turned his critiques (like don't eat anything with more than five ingredients) into another way to sell consumers more food. His new rule of thumb? "Don't eat any foods you've ever seen advertised on television." Michael Pollan, one of the best-known names in food-related issues, offers a guide about health and food. Food Rules: An Eater's Manual is a set of memorable ideas for eating wisely. Many of them are drawn from a variety of ethnic or cultural traditions. Whether at the supermarket or an all-you-can-eat buffet, this handy, pocket-size resource is for people who would like to become more mindful of what they are eating. Michael Pollan is the author of The Omnivore's Dilemma: A Natural History of Four Meals, a New York Times bestseller. His previous books include The Botany of Desire: A Plant's-Eye View of the World (2001); A Place of My Own (1997); and Second Nature (1991). A contributing writer to The New York Times Magazine, Pollan is the recipient of numerous journalistic awards, including the James Beard Award for best magazine series in 2003 and the Reuters-I.U.C.N. 2000 Global Award for Environmental Journalism. Pollan served for many years as executive editor of Harper's Magazine and is now the Knight Professor of Science and Environmental Journalism at UC Berkeley. His articles have been anthologized in Best American Science Writing 2004, Best American Essays 2003, and the Norton Book of Nature Writing. He lives in the San Francisco Bay Area with his wife, the painter Judith Belzer, and their son, Isaac. Have you ever wondered why a bunch of carrots costs more than a package of Twinkies? Food journalist Michael Pollan connects the dots between food policy, high-fructose corn syrup, and our health. Have you ever tasted a purple potato or a golden beet? Chef Jamie Oliver, star of TV's Food Revolution, invites us to explore a world of new tastes. Have you watched his show on TV where he is trying to get our children to appreciate and eat food that is better for them by working to develop healthy school lunches in several school districts and states? Jamie works hard trying to get across a very important message, that the nutritionally poor diet that our kids and many adults are eating is literally making them sick. 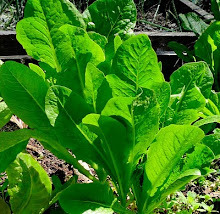 These vegetables can be grown easily at home in your backyard, front yard, patio, deck, in raised beds, wood and other large pots, planters, half wine barrels or any other creative container you can come up with. It is fun to nurture and grow vegetables and then eat what you grew. When gardening we are exposed to a bacteria in the soil that actually generates Serotonin in our brains that causes us to feel happy. It is supposed to be better than taking Prozac! And we also get to eat healthy food from our own hand. Give it a try, you won't be disappointed!! !